I love the color yellow because it’s bright and cheery. I’ve never worked with seed beads and can’t say they aren’t my first bead choice because I find them to be tediously too small. 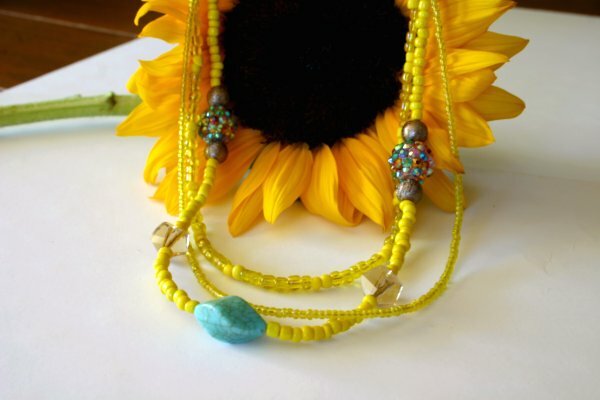 But I was inspired by a multi-strand necklace that someone gave to me made up of all seed beads. I actually bought the beads this past summer and it’s just turned to fall, so the color isn’t in season. Though living in San Francisco, it doesn’t matter too much. Our summer is actually right about now. 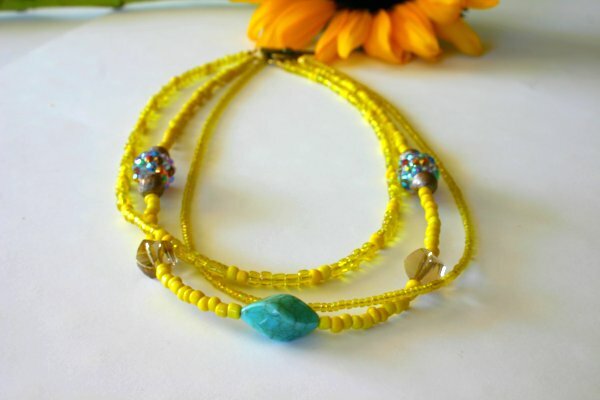 Working with the yellow seed beads I came up with this pretty yet casual multi-strand necklace. It’s so feminine, but not over the top girly. It’s got a bit of bling, but again, not overboard. When I was working on it the word ‘Satya’ just popped into my head. When I went to google it to determine that it was actually a word, I delightfully discovered that it stands for real or true; truthful, sincere. I thought that was so perfect. Be true to yourself.